Everyone wants to be a winner. But let's face it, not many people are. Me included. I've entered so many contests and lost that I've wondered at times if real people actually win prizes. But then I created NextGen Player and everything changed. Now instead of entering contests, I create contests. And instead of losing contests, I actually award contest prizes. For the selfish type, this would be a highly undesirable position to be in. Lucky, I am like Santa Claus and get fat on milk and cookies and enjoy the gift of giving. 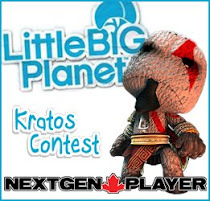 So who was the lucky LittleBigPlanet contest winner? The congratulations go to Antoni Ruizh with the amazing Tie Skipping high score of 1,083. That's a full 399 points above my low, low score of 684. I'll be emailing Antoni soon to let him know he won. The runner-up was Joseph Martinez with the very respectable score of 940. So what about December? Considering it's the season of giving, we might as well give out some more goodies. Some Gears of War goodies.